Downloading HootSuite for mobile gives you the features and tools found in the HootSuite web dashboard and puts them into a pocket-sized tool which is custom made for a unique mobile experience. To help get you acquainted with the functionality, or just for a refresher, here’s a new #HootTip about a handy mobile HootSuite feature. The number of ways to keep in touch with your social circle is almost endless. Having more than three or four social profiles, is not uncommon and can make finding your friends or colleagues a bit of a task. Twitter is no exception to this and it can be a bit of a process to find which of your contacts is active on the social network. Thanks to a unique HootSuite for iPhone feature, we’ve made finding your friends on Twitter a breeze. 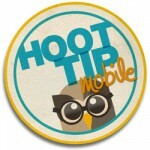 Open your HootSuite app, and tap “More”. Next, tap “Contacts” and then “#$%^&*(“. This will bring up a list of contacts from your iPhone that have Twitter accounts! Follow at will and if you don’t see many contacts, try updating your contact list and make sure you have their email in their contact info!